Infographic by Chris Scott, click here to view the image full screen. A TOTAL of 173 prisoners died while serving sentences across the island of Ireland during the last decade, new figures have revealed. 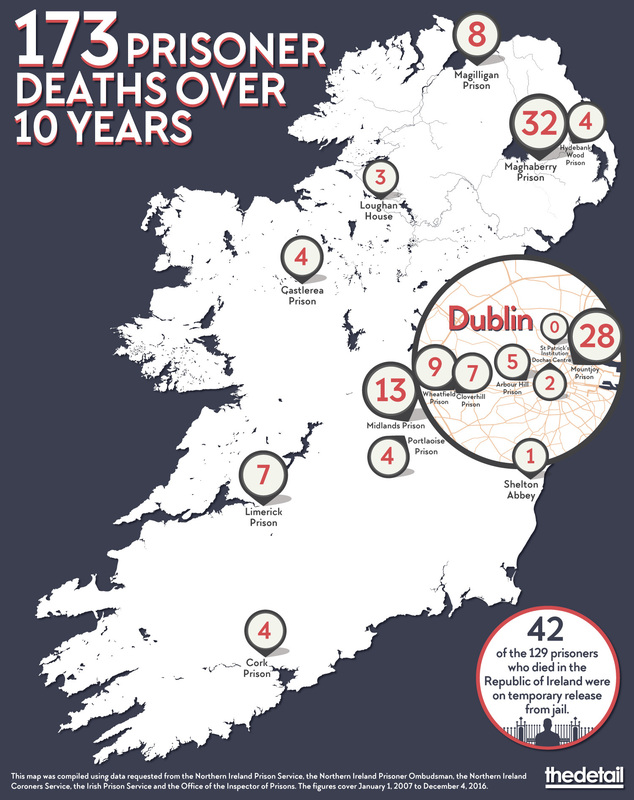 There were 129 deaths in the Republic of Ireland, where the prison population is more than twice that in Northern Ireland, though prisons north of the border still recorded 44 deaths. Both sets of figures included inmates who were granted temporary release from jail, but that mechanism is more widespread in the republic, where nearly a third  of the inmates who died were finishing their sentences in the community. Campaigners have raised concerns over the number of deaths, which was calculated using data obtained by The Detail and covers the period between January 2007 and December 2016. Additional figures have also revealed that a number of investigations into the circumstances surrounding the deaths are still outstanding. Click here to view a database compiled by The Detail using the statistics requested under Freedom of Information legislation. The republic’s Inspector of Prisons since 2008 was Judge Michael Reilly, who oversaw major reforms of the oversight of the prison system, but who died suddenly on November 26. Judge Michael Reilly was Inspector of Prisons in the Republic of Ireland from 2008 until his recent death. Amid growing concerns over Northern Ireland’s prison system, Queen’s University Belfast academic Professor Phil Scraton called for an independent inquiry similar to the panel that he sat on to probe the Hillsborough football disaster of 1989. “What has been happening in prisons in Northern Ireland, particularly around the issue of vulnerable prisoners and the rate of self-harm and suicide, is of that magnitude,” he said. The families of 18 prisoners who died in Northern Ireland over the past 10 years are still waiting for an inquest to be held, despite obligations under UK law relating to prison deaths. Inquests are still pending in relation to 26 prisoners who died in the republic. The law currently requires a coroner’s investigation of sudden deaths, though new legislation making it obligatory for a coroner to examine all prison deaths has been on the drawing board for nine years. The Detail used Freedom of Information (FOI) legislation to ask questions of nine coroners in the republic whose jurisdiction is thought to include a prison, but there was a lack of consistency in accessing information. The government Department of Public Expenditure and Reform advised that coroners were subject to FOI. But while two coroners indicated that no jail deaths occurred in their area, and four others did provide details on investigations they had undertaken, a further three coroners declined to give information under FOI. Dublin, Laois and Cavan coroners said the data could be secured under separate legislation for a fee and said they plan to write to the department to question whether they should be subject to FOI “given the special function performed by them”. Click here to read how a delay in holding an inquest into the death of a Maghaberry prisoner has affected his mother. The Irish Prison Service refused to reveal information on the causes of deaths, however, data from the Inspector of Prisons dating from 2012 showed that of the 76 prisoners who died since then, 22 were suspected suicides, 19 were drugs-related, five were homicides and 28 were natural causes. One death was a result of a road traffic collision and another caused by a house fire. A third  of the inmates who died in the south were finishing their sentences in the community at the time. Read more about the situation in the Republic of Ireland here. The number of inmates who died in each prison across the republic. Read more about prisoner deaths in Northern Ireland here. Breakdown of prisoner deaths in Northern Ireland by cause between 2007 and 2016. A spokesperson for the Irish Prison Service said every death in custody is a tragedy. He added: “It should be borne in mind that deaths in custody can occur for a number of reasons including age or underlining medical issues on committal leading to death by natural causes, deaths by drugs overdose, or deaths by suicide. The prison service's full comment can be read here. The Northern Ireland Prison Service declined to comment on The Detail’s findings, but instead referred to a recent statement by Stormont Justice Minister Claire Sugden. During a spate of deaths last month, she told the Assembly that there will be an internal review by the Departments of Justice and Health into vulnerable prisoners in custody. Click here to read the minister's full statement. Further comments from the trust can be read here. The Detail recently reported that one in four new recruits to have joined the Northern Ireland Prison Service since 2012 have left and now the Prison Officers’ Association has voted in favour of industrial action at two jails, raising concerns that staff shortages could increase pressure. Meanwhile, a Private Member’s Bill by Clare Daly TD aimed at restricting solitary confinement was debated in the Dáil on December 1 and will now proceed to committee stage. Ms Daly supported her initiative by drawing on previous research by The Detail showing inmates were held in solitary for months and in some cases years. Click here for previous coverage on prisons by The Detail.